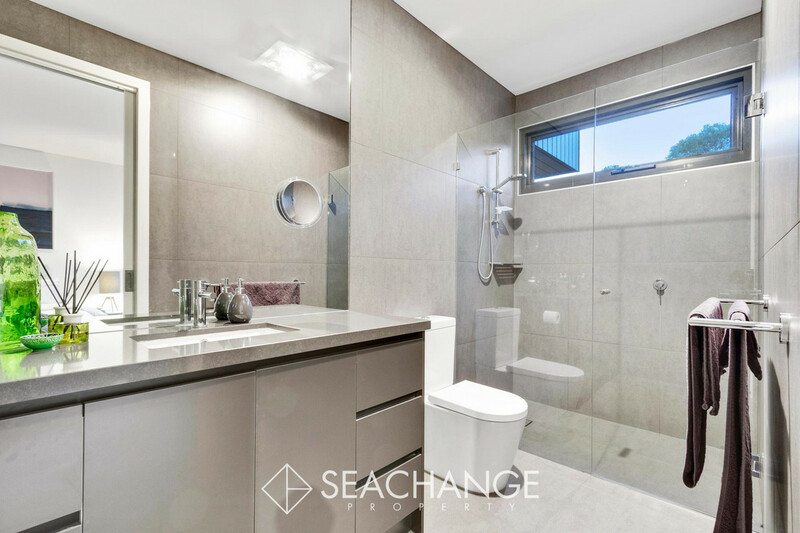 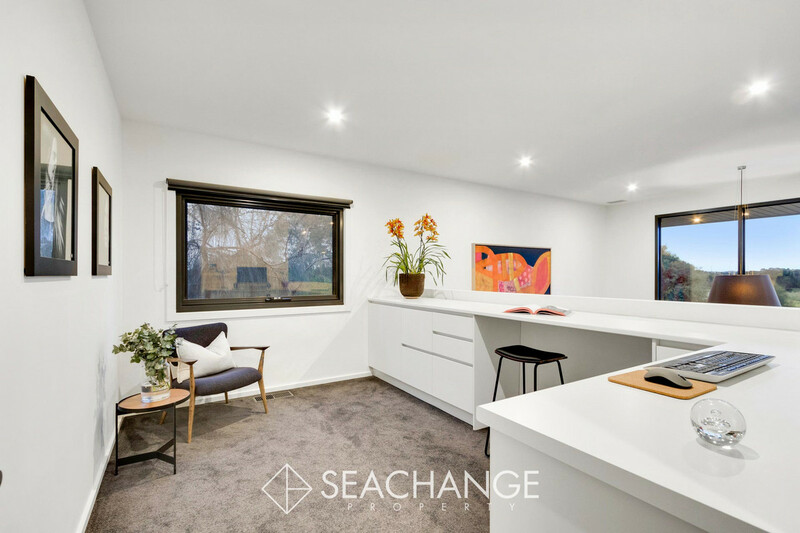 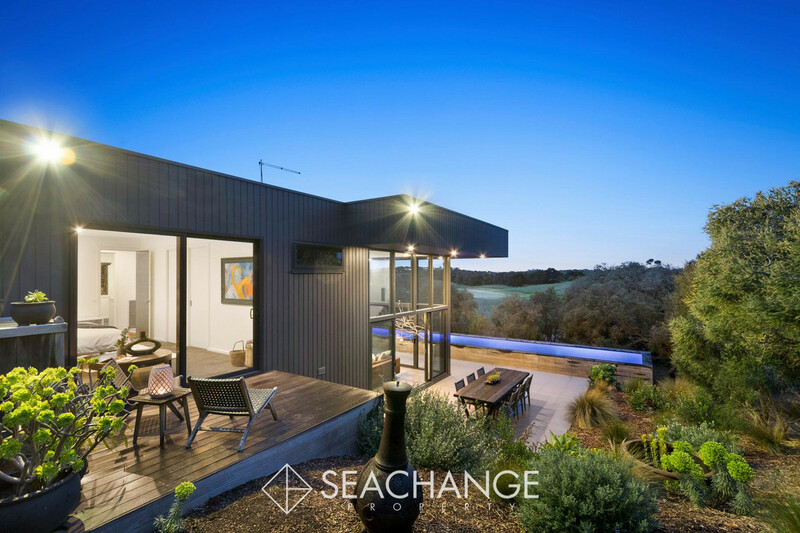 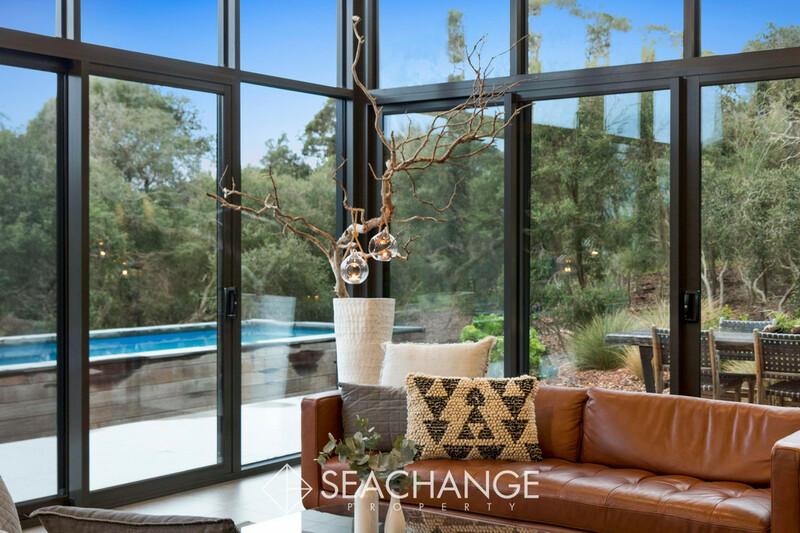 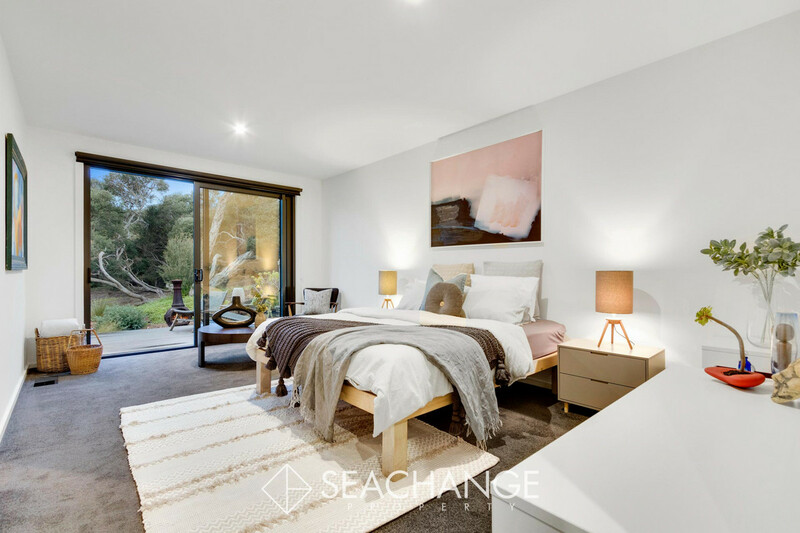 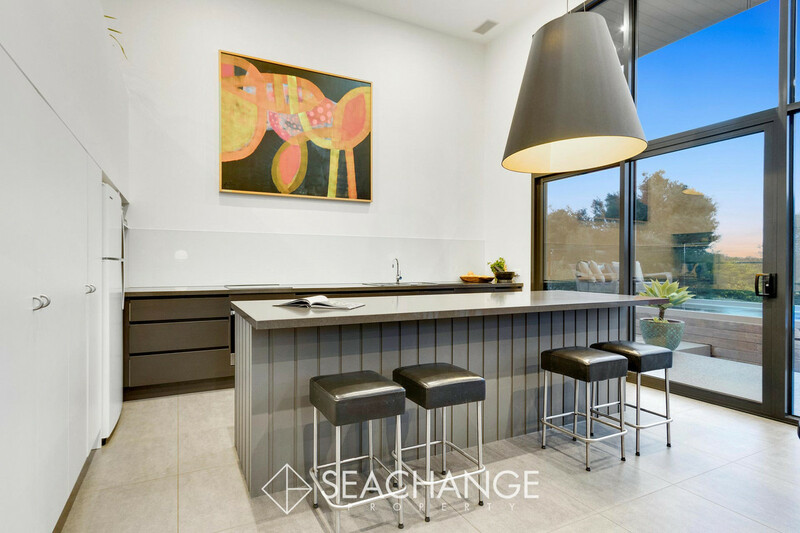 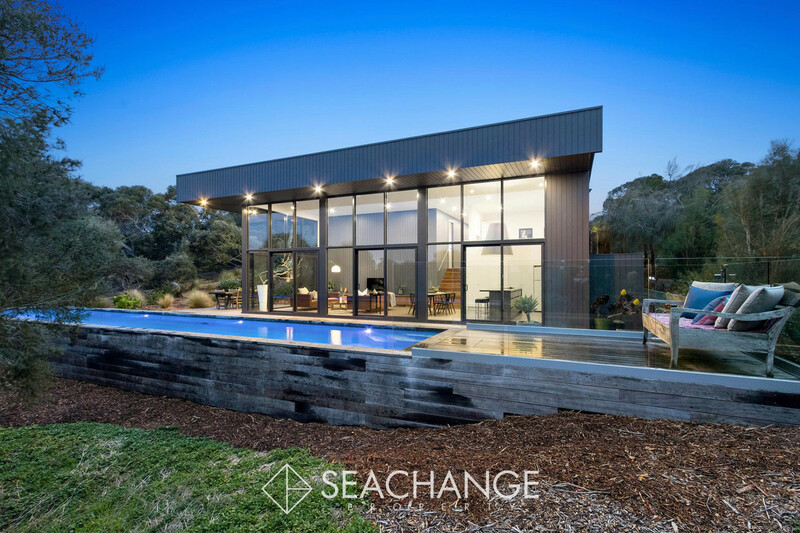 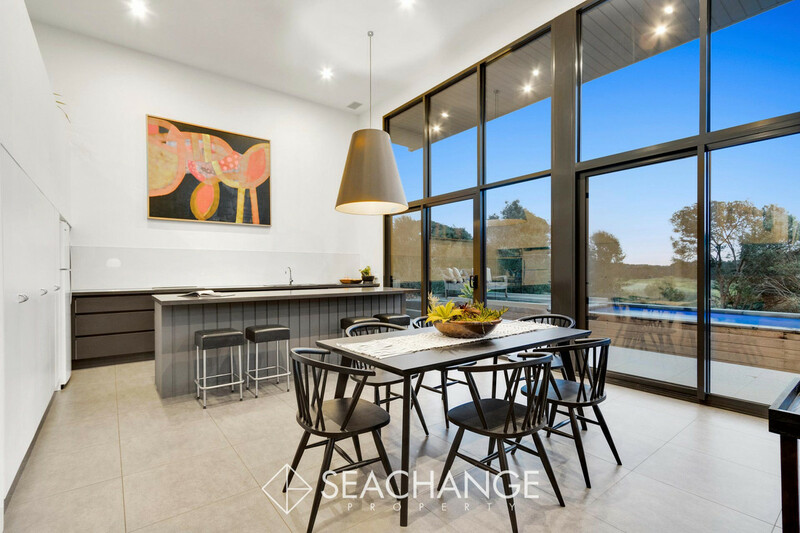 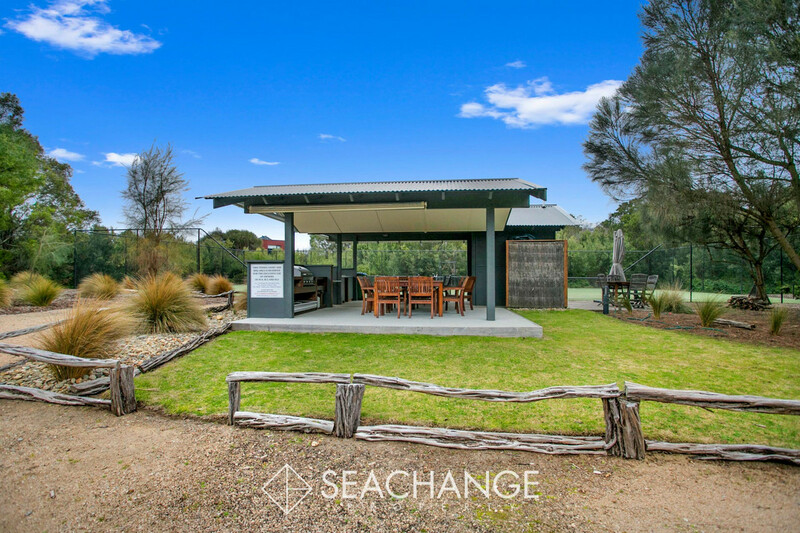 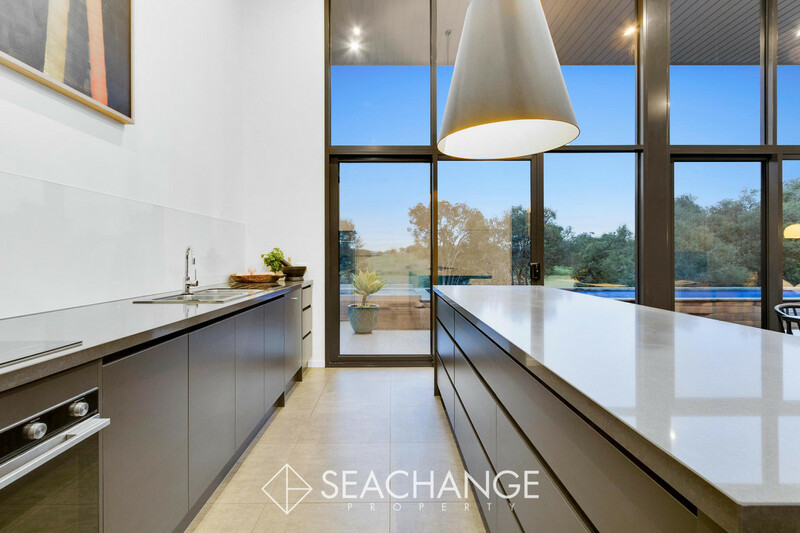 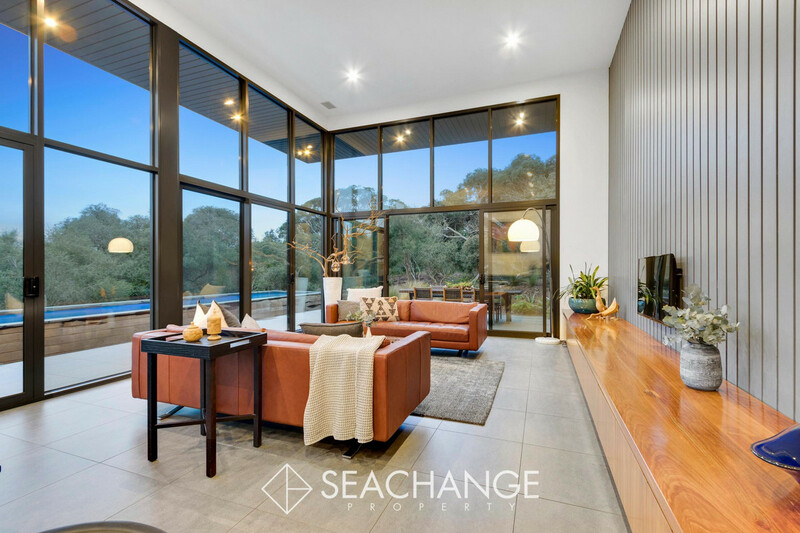 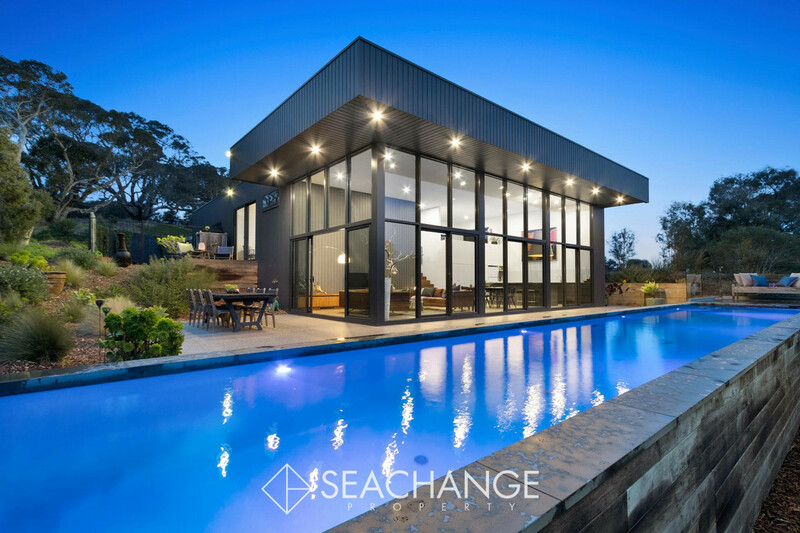 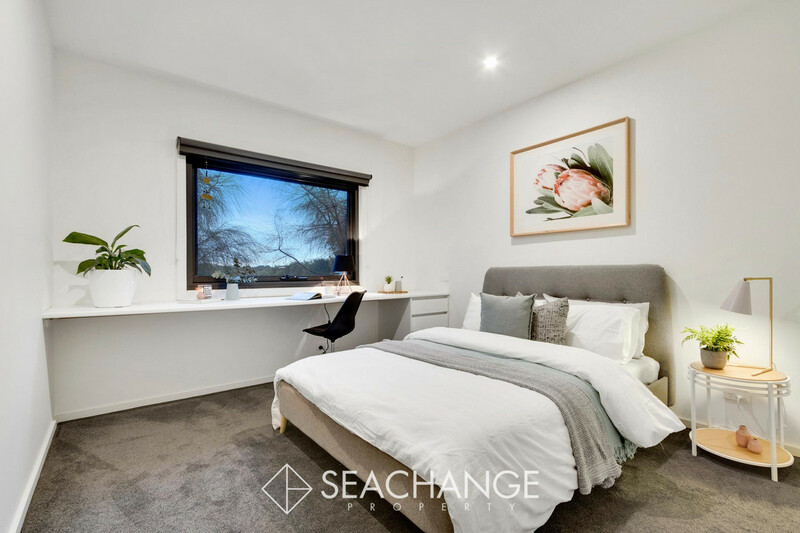 “At one” amidst a beautiful undulating landscape surrounded by ancient Moonah woodland, self-caring indigenous gardens and rolling golfing greens to admire. 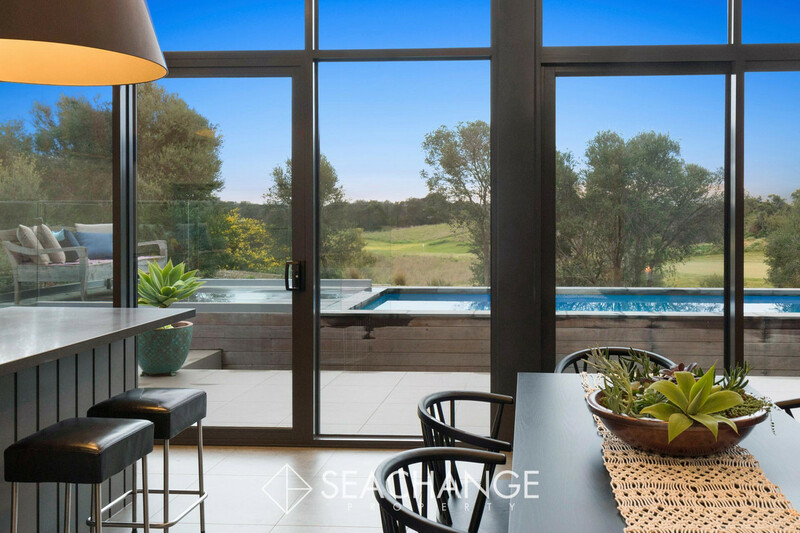 Escape to a lifestyle of rest, relaxation and luxury at this three-bedroom-plus-study resort-style property in The Ridge residential precinct of the Moonah Links Estate. 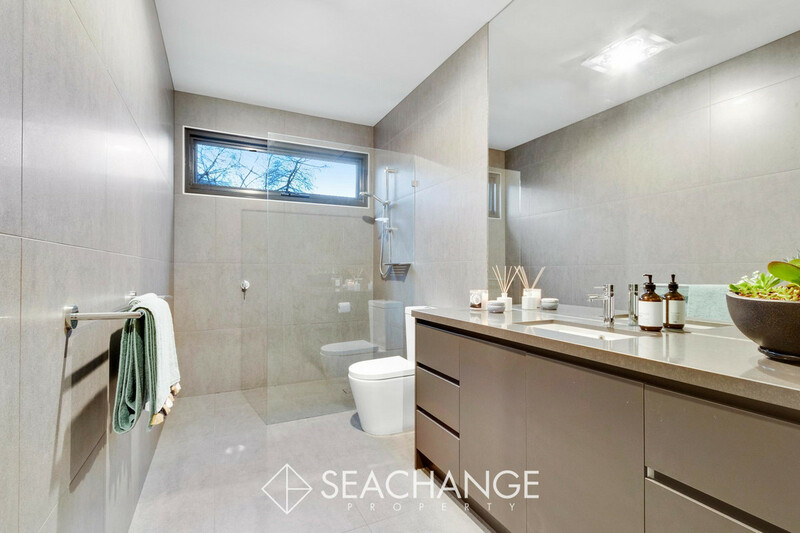 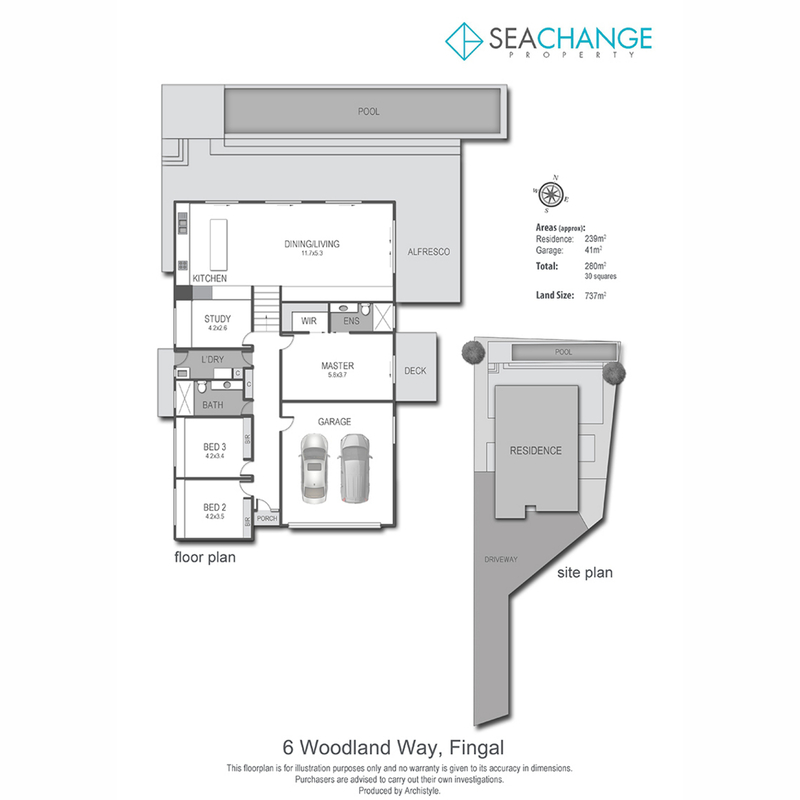 The unique, split-level design includes a wide entrance hallway, fully-tiled bathroom facilities, large laundry and ensuited master bedroom with walk-in robe and private deck. 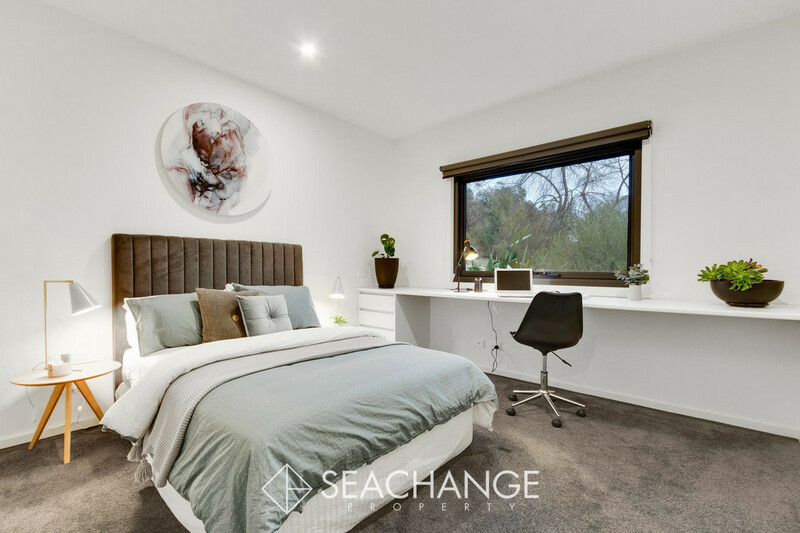 The remaining bedrooms have built-in robes and full length desks for children or guests. 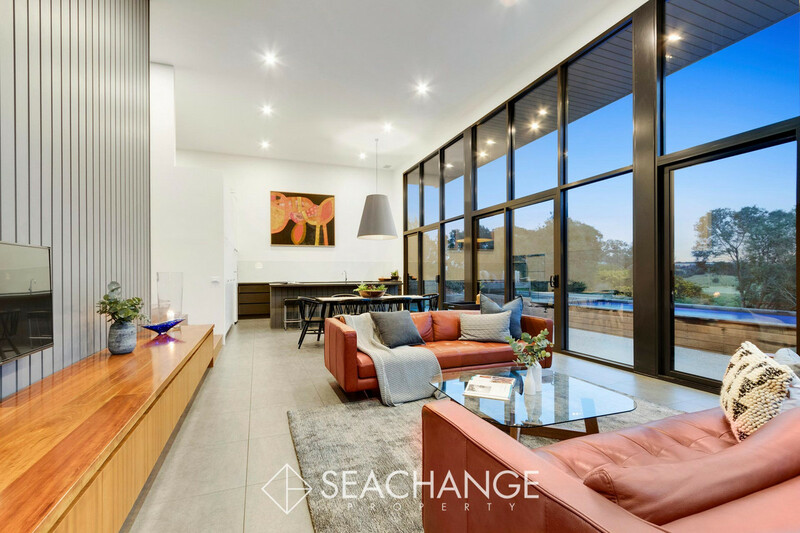 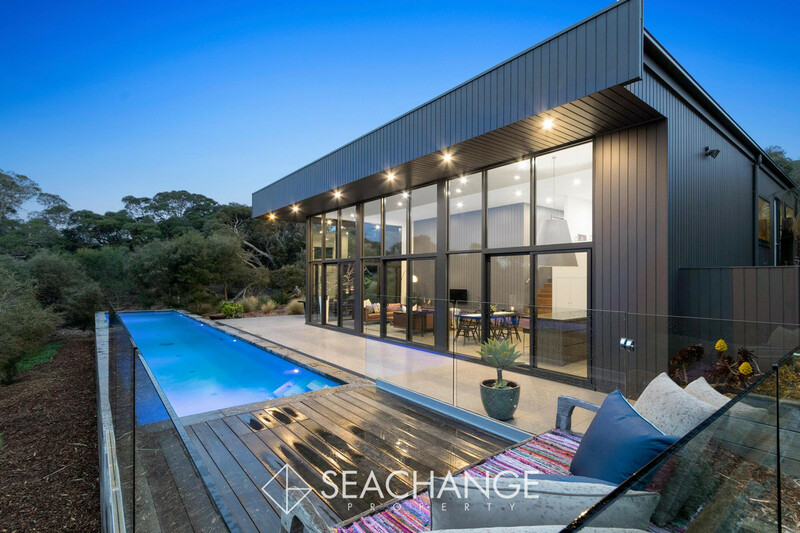 An atrium-style open-plan living zone showcases 4.5m glassed walls to flawlessly blend with the expansive paved terrace, sunbathing platform and 15m x 2.4m self cleaning salt water solar lap pool. 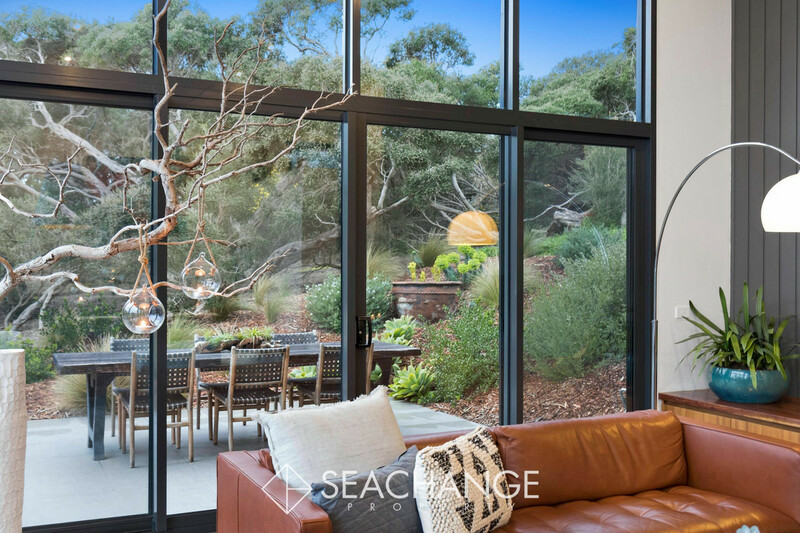 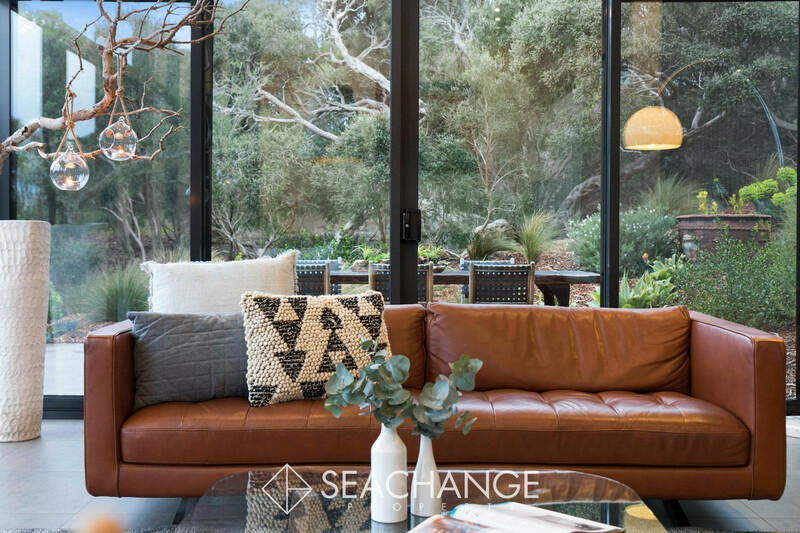 Oriented to the North, this gorgeous, sheltered indoor-outdoor living space can be enjoyed all year round. 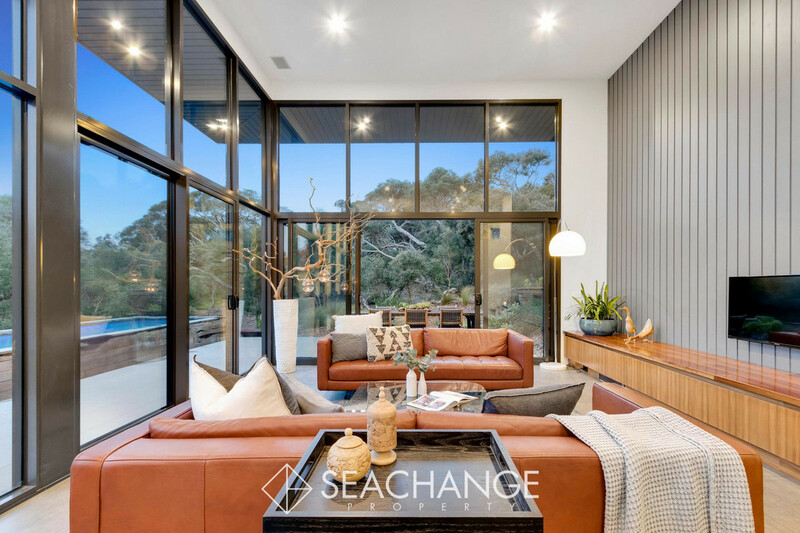 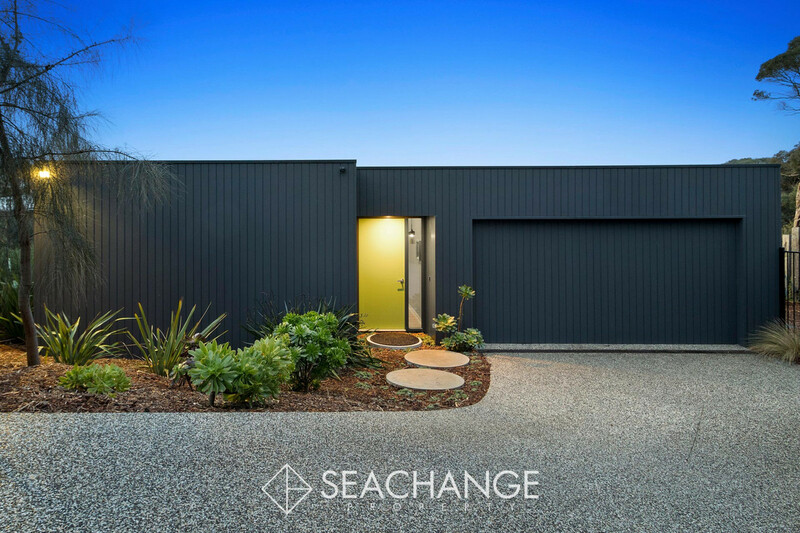 Striking modern features and contemporary trappings are highlighted throughout the build such as shiplap wall cladding, polished spotted gum floorboards, frameless showers, high ceilings and square-set cornices. 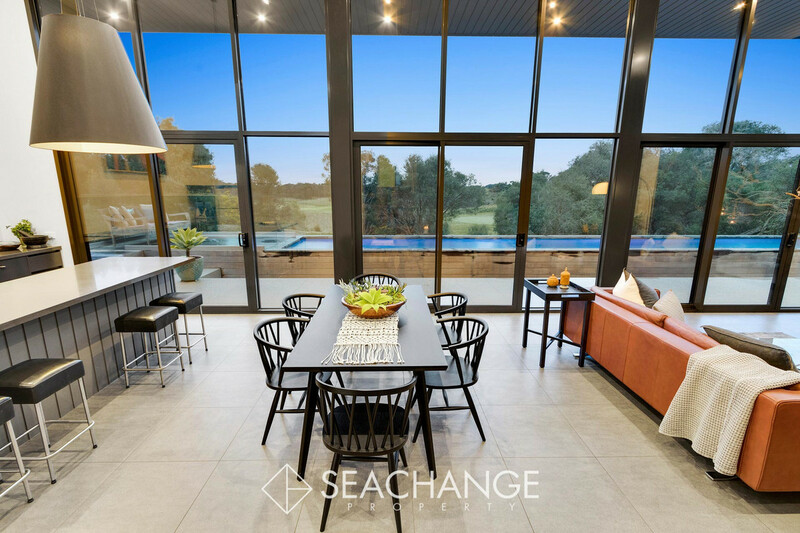 Feel like you’re living on acreage in a quiet cul-de-sac bordering the tee of the 2nd hole on The Australian Open golf course where the sprawling greenery seems to run for miles. 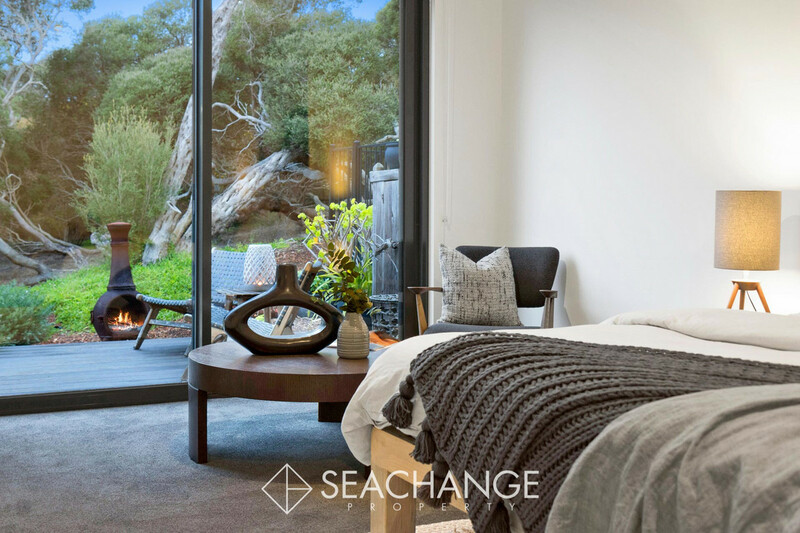 Absorb nature’s coastal neighbourhood 24/7. 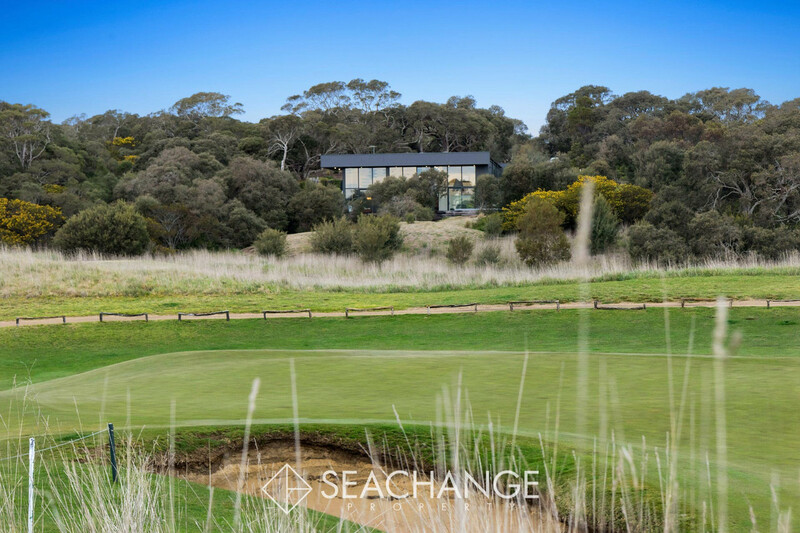 Effortlessly walk the rear trail to the popular clubhouse, socialise with your best golfing buddies at the bar, visit Peppers Restaurant for some fine dining and experience the resort’s relaxing day spa. 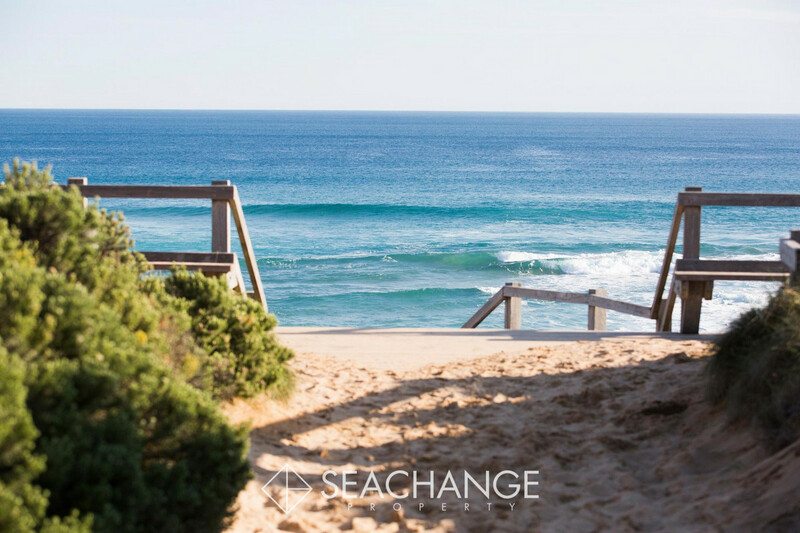 Enjoy the sights and delights of the wonderful Mornington Peninsula. 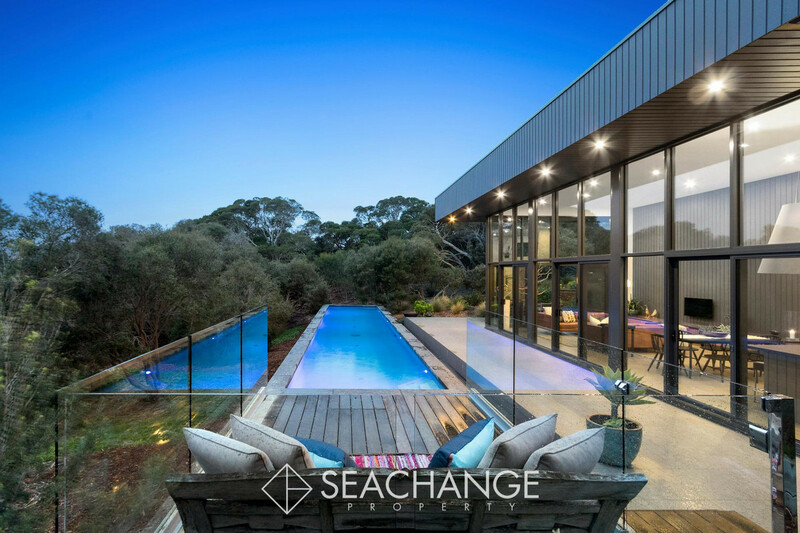 There’s the new St Andrews Beach Brewery, adventurous surf and bay foreshores and the Peninsula Hot Springs, accessible by a private gate, nearby.